Rafael Nadal remains in the hunt for an 11th Monte Carlo Masters title, but a mouth-watering quarter-final against Novak Djokovic was scuppered by Dominic Thiem. World number one Nadal cruised past Karen Khachanov 6-3 6-2 in just 79 minutes in his third-round match, but fans in the principality were denied a heavyweight last-eight meeting between the Spaniard and Djokovic. The Serbian showed signs of promise as he continues his comeback from an elbow injury, but he let a one-set lead slip and Thiem fought back to claim a 6-7 (2-7) 6-2 6-3 win. Marin Cilic was granted a walkover after Milos Raonic withdrew due to a knee injury and he will face Kei Nishikori next, the Japanese beating Andreas Seppi 6-0 2-6 6-3. Grigor Dimitrov required three sets to get past Philipp Kohlschreiber 4-6 6-3 6-4 and Richard Gasquet thwarted a sibling match-up in the quarter-finals by eliminating Mischa Zverev 6-2 7-5. Nadal and Thiem met four times during the clay swing last season, with the Spaniard coming out on top in the most important outings. The 31-year-old triumphed in finals in Barcelona and Madrid as well as a semi-final clash en route to claiming his 10th French Open title. 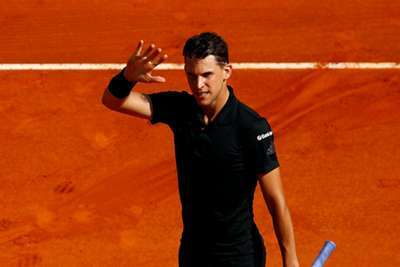 Thiem was the victor when they met in the quarter-finals of the Internazionali d'Italia and he will be hoping to channel that display and overcome the 'King of Clay' as he attempts to secure a first ATP Masters 1000 title. 10-time champion @RafaelNadal sets #RolexMCMasters QF vs. @ThiemDomi . Nadal has won 30 straight sets on clay since losing to Thiem in 2017 @InteBNLdItalia QF. Thiem is 1 of 2 men to beat all members of Big 4 on clay (also Wawrinka). Spaniard leads Austrian 5-2 H2H -- all on clay. Roberto Bautista Agut was not happy after dropping his serve in the second set against David Goffin and he hit a ball into the ground in frustration, unknowingly sending it into the direction of a ball boy. It bounced up and caught the youngster on the head, earning the Spaniard a warning from the umpire, despite his opponent appearing to lobby for him to be defaulted. Bautista Agut then gave Goffin a headache by rallying back from 5-1 down in the second, saving two match points to draw level, but a break of serve at a crucial point enabled the Belgian to close out a 6-4 7-5 win. Thanasi Kokkinakis took a fall after running into an advertising sign, positioned in front of the line judges, during his defeat to Khachanov and the Australian responded by kicking it away. Alexander Zverev was similarly unimpressed by the location of the sponsored padding during his 6-4 4-6 6-4 triumph over Jan-Lennard Struff, throwing it to the side and having a request for them to be moved rejected by the umpire. The world number four – who would have faced his brother had Mischa beaten Gasquet - later threw his racket into the ground and spat in the direction of the crowd, but he refocused and sent Struff tumbling out of the tournament.